Subaru Forester gets a complete remodel for 2019, and it also gets more high-tech. The Subaru Forester has been known as a capable all-wheel-drive SUV with utility, but not as a vehicle that was loaded with technology. Forester’s infotainment was sparse at best. but that is changing. 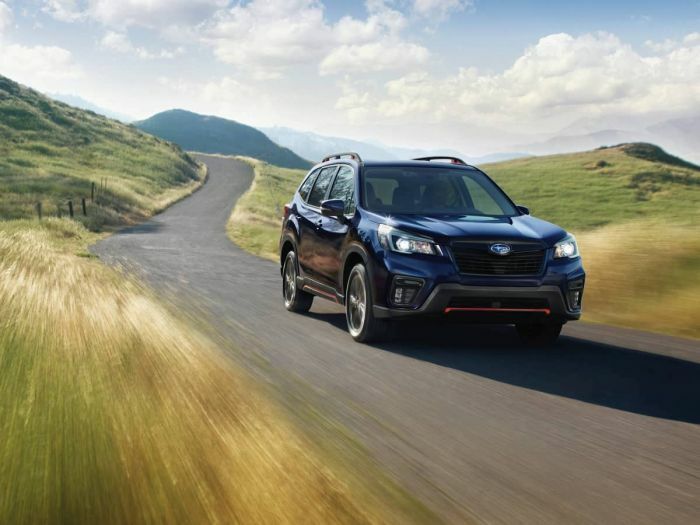 Subaru of America announces a new Subaru Starlink Entertainment Anywhere infotainment system is available on the all-new 2019 Forester SUV. Forester also now comes with EVEConnect to keep customers connected. Subaru of America announced all-new 2019 Forester models get a bump in price over the previous model year. The redesigned fifth-generation Forester comes in five trims with Base, priced from $24,295 (+$1,500), Premium $26,6945 (+$1,000), Limited $30,795 (+$1,400), Touring $34,295 (+$1,205), and Sport $28,795 (new model for 2019). Pricing does not include $975 destination and delivery charges. The all-new 2019 Ascent SUV, was the first Subaru model to offer an in-vehicle WI-FI hotspot, and the 2019 Forester is the next nameplate to get it. The new Starlink Entertainment Anywhere kit includes two 9.7-inch iPad 32GB Wi-Fi models, two Harman Kardon Bluetooth headphones, and two Otterbox Defender Series iPad cases all for $970. This is cheaper than purchasing a dual-headrest DVD entertainment system. It’s also cheaper than buying the items separately. The kit’s MSRP of $970 offers about $368 in savings by purchasing through Subaru versus paying retail for each component separately. There is a catch. The kit is only available either during or after the purchase or lease of a new Subaru. So, you can’t go in and buy the kit for your older Subaru Forester. The standard SUBARU STARLINK Forester app now offers EVEConnect to keep customers connected. EVEConnect is a home/connected car integration ecosystem allowing drivers to access, control and automate all of their smart home devices, from the convenience of their vehicle dashboard. Forester owners can control locks, garage doors, lights, thermostats and more, even when on the go. Ergonomically designed for safe and effective in-car usage, EVEConnect provides seamless connectivity, while reducing driver distraction. The all-new fifth-generation 2019 Subaru Forester gets a price increase and more high-tech. The new models will begin arriving in showrooms this fall. Can you confirm Apple carplay, et al ? Does the price increase include the eyesight standard across all models? Is that partially the reason for the increase? What does EVEconnect actually do? No offence but sloppy article.